'It is such a privilege to be able to devote my life to doing the things i love - cooking and art. Sharing creations from them bring more joy than there can be." - Andre Chiang (江振誠). Chef-owner Andre Chiang of Restaurant Andre, was born in Taiwan and now widely considered as the top chef in Singapore. He started to cook when he was a junior, he went to France to lift his culinary skills when he was only 20. In 2008, he decided to move to Singapore. 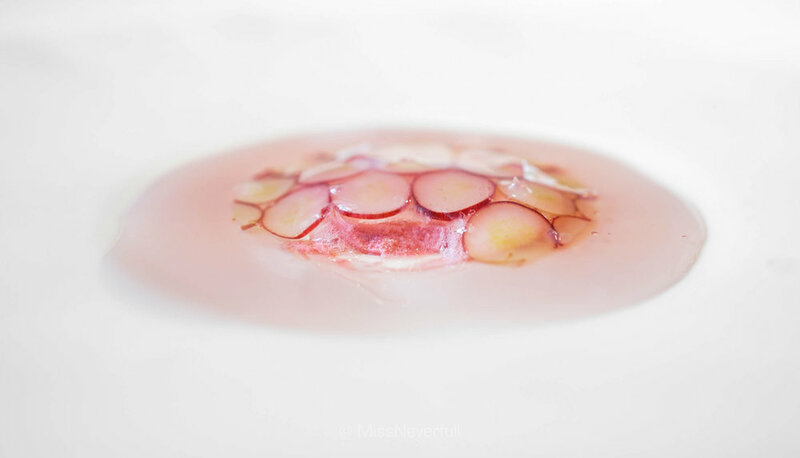 Before opening his ownrestaurant André, Andre Chiang worked in JAAN for two years and brought restaurant to its peak times with a hornor of'Best 50 Restaurants in the World'. 2011, Andre left JAAN and opened Restaurant André in the heritage Chinatown area. Andre serves Southern French nouvelle cuisine reinterpreted, by bring the deep Asian roots with the traditional Southern French cooking, André brings all the guest a unique and memorable Singaporean experience. 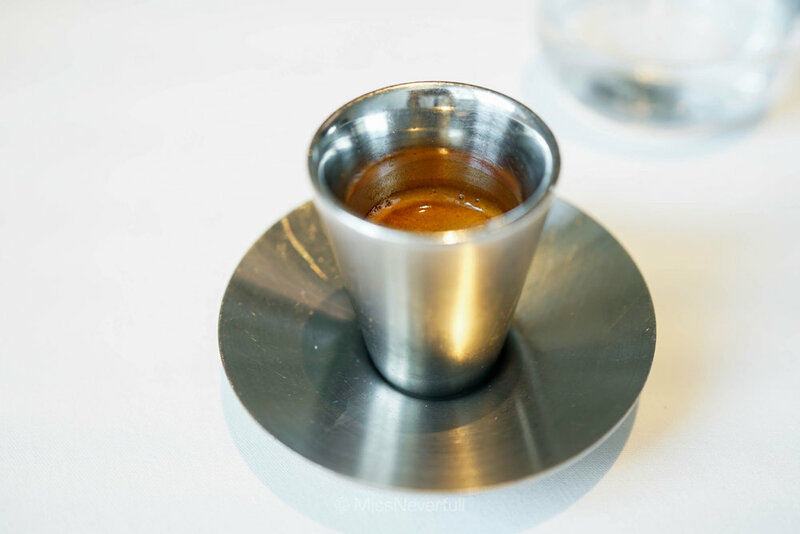 It had been almost a year since my last meal at André. It was a shorter lunch experience and i was quite impressed. I absoutely loved everything here - the simple and clean decor designed by Andre's wife, friendly servers who have a good knowledge of the food they are serving, the philosophy and origins behind each dish, and of course, the simply delicous food that has pure tastes with complexilities...When all these factos bring together, the outcome is the reason why i am here again. This time, for the complete Octaphilosophy experience. Andre housed in a >100-year old historical building, the restaurants have 3 stories of seatings. A chef's table for large parties over 10 pax on the ground floor, the second floor has a warmer and elegant ambiance, and a simple white-tone decor on the third floor. So, what is octaphilosophy? Octaphilosophy is owner-chef André Chiang’s set of guiding principles, centred on eight qualities he deems essential to the restaurant’s DNA: unique, pure, texture, memory, salt, south, artisan and terroir. Each of these eight elements represents one dish on the menu (exclude desserts) , with chef Andre's intriguing perspective of Taiwanese heritage, Japanese childhood, French training and a Singaporean setting. You are expected to pay $350++ for a complete octaphilosophy experience prepared by Chef Andre Chiang, it is pricey but definitely worth (a) visit(s). In the meanwhile, try their 5-course lunch at a more pocket-friendly price of $198++, avilable only on Wednesday and Friday lunch time. One of the boldest things about André is its all-natural wine policy. As most of the dishes are quite pure in tastes, the sommelier recommended the French white wine Energie 7. Andre also serves homemade fermented drinks which is very good for digestions. The meal started with several savory snacks to open my palates. My eyeballs were attracted by the lovely wild mushroom tart as soon as it was served, chef uses wild mushroom paste in the center and baby nameko mushroom outside. I really loved its deep mushrrom flavor with a creamy texture. On the right side, the celeriac tart with a twist of miso was very unique and delicious too. A 'tree' of spicy, bitter and sour flavors, again akawen my taste buds. Followed by de-hydrated olives and pineapple which has a harmony tastes of sweet, sour and savory flavors. Next comes a tray of charcoal, help yourself with the only edible charcoal :D This is actually a charcoal bread, it has a lovely char-grilled aroma, i loved its soft and chewy texture. The charcoal was served with Amaebi paste, it was incredibly smooth, sweet and umami that works amazingly good with the charcoal bread. From the ocean to the table, next a large plate of edible coral and seafood came to the table. I really loved the creamy abalone liver paste which was high in flavor and matches well with the fragrant abalone. 'Fish and chips' has a crispy crust and moist flesh in the center. The coral-shaped prawn head tempura was crispy and umami. Such an awesome plate of oceanic flavors. The first dish of the 8 octa-dishes was 'uniuqe' that lead us to explore an ingredient with curiosity. Corn is the main ingredient here, paired with bitter almond, horse radish and vanilla oil. Scope from bottom to the top, the entire bite has a deep corn flavor with a sweet aftertastes, it was so smooth and creamy. The char-grilled corn in the center gives a crispy and juicy texture. The second dish is a stone crab tartare, topped with fresh sea urchin and Japanese cucumber and its flower, garnished with cucumber sorbet. As how its called - pure, you may find the beauty in anything and everything. All the simple and delicious flavors are from the ingredients themselves, as well as the aroma and texture. Juicy and succulent crab meat, fresh and creamy sea urchin, with crunchy and refreshing cucumber, such a mouthful of pure flavors. Clean and delicious. I was equally impressed by Andre's homemade baguette last time, while this time, the homemade sourdough was served. It was baked in the oven at Burnt Ends, another restaurant of Andre Chiang. This was the best sourdough i had in Singapore recently - with a crispy crust and soft, airy center. You can even see the real wholemeal fibres inside. One of my favorite dishes from the last meal was again served, i don't mind to have it everytime here :) Although it is called 'salt', and salt is essential to make the food delicioust, here is totally NO salt used in dish. Instead, let the ingredients themselves unfold and evolve. This is not your common pasta, chef sliced the squid into a noodle shape to create a oceanic flavor, with kelp jus and seaweed powder to enhance the deep umami taste. On the bottom of the green jus, potato mousse was adeed for more creamy textures. This dish is not complete without the toasted whole grains (barley, splet, wild rice) on the side, so textural and flavorful. And back to the table, a large burnt oyster from France was beautifully presented in the plate. It was bedded with eggplant puree and topped with a thin layer of scallop lasagne and caviar aubergine. On the side, the watercress foam with sun-dried vinegare gives a acid and refreshing touch to pair with the fresh flavors of seafood. I was quite surprised by this combination, especially the scallop lasagne which was incredibly tender and delicious. The whole dish is very clean but deep inside. Follwed by a soup-based dish of roasted topinambour. Chef roasted topinambour to a potato-texture, its roasted aroma paired well with the delicious Aji (horse mackerel). The burnt kale was crispy and its bitterness was nicely balanced with the umami soup. Topped with caviar to give a burst of umami flavors. One of my favorite dishes of the meal was the wild gungus risotto. We were the only table ordered the full course menu during on the third floor, before serving this dish, i saw the manager shaved black truffle to other tables thus i expected a lot on my food. Although i know this was not the white truffle season, i was shocked when i saw this 'white truffle' appeared in front of my eyes. The answer was no. I was a little bit disappointing because the other tables were served the real black truffle. While i didn't feel regret when i was told this is Chiang's homemade cheese with spice and Himalayan salt, to him as well as the whole team, this is their Alba white truffle, or even more cherished than Alba. The 'risotto' is acutally made of Orzo pasta (pasta shaped like grains of rice), cooked with wild fungus to give it a naturally & deep flavors of the land. It was covered with a layer of crispy buckwheat wafer and finished with shaved 'truffle cheese'. The best way to enjoy this dish is to mix it up, and you will find a runny egg yolk in the center. This was indeed a dish of 'TEXTURE' - soft, crusty, hard, porous, slimy, dense, elastic...so enjoyable and unforgettable. The reason why this dish is called 'memory' is because Chef Andre created this dish 19 years ago, and it never disappeared from the menu. When foie gras becomes so common this days, i found it is quite hard to find a foie gras dish that really surprised me. This is an exception. The silky and flavorful foie gras jelly was insane, topped with aromatic black truffle jus to enhance the flavor. Aromatic, creamy, deep...amazing 'memeory' to be memeorized. The final component of octa is 'terrior' - salt baked chicken breast. To be honest, i don't like to see chicken on my menu when i fine dine, but this dish changed my opinion of the ingredient i don't really like. The chicken breast was wrapped with seaweed and lotus leaf, coated with ash bread to be baked with salt. The server cut cut the bread by the table and carefully took out the chicken breast inside the bread, remove the lotus leaf and serve it to the plate. Only the chicken breast with seaweed was edible. In the plate, there were forest chips made of onion, gobo and king oysters, side by the chicken breast was smoked eel jelly. Most chicken breast are quite dry and bland, while tirst cut into the chicken was already surprised me, it was that tender and juicy, so moist that the texture is nearly crunchy. The eel jelly as well as the seaweed wrapping gives umami flavors of the sea. The vegetable chips added a crispy texture and flavors of the land to the dish. Then move on to the dessert. The first dessert was full of green flavors, consists of green pea in different forms: ice cream, fresh green pea, oil, jelly, chocolate and finish with hot green pea mousse. I really enjoyed this dish of harmony green pea flavors, different textures and temperature that won't make you feel boring, even you are not a big fan of vegetables, i am sure you will love it. It was mildly sweet and full of spring flavors. The second dessert was too pretty to eat. Underneath the white bergamote jelly and dliced fresh grape, you can find white peach mousse. The souness of bergamonte balanced very well with the naturally sweet white peach, a very elegant dish that hard to not love it. The last dessert of the meal was Chef Andre's homemade camembert cheese. 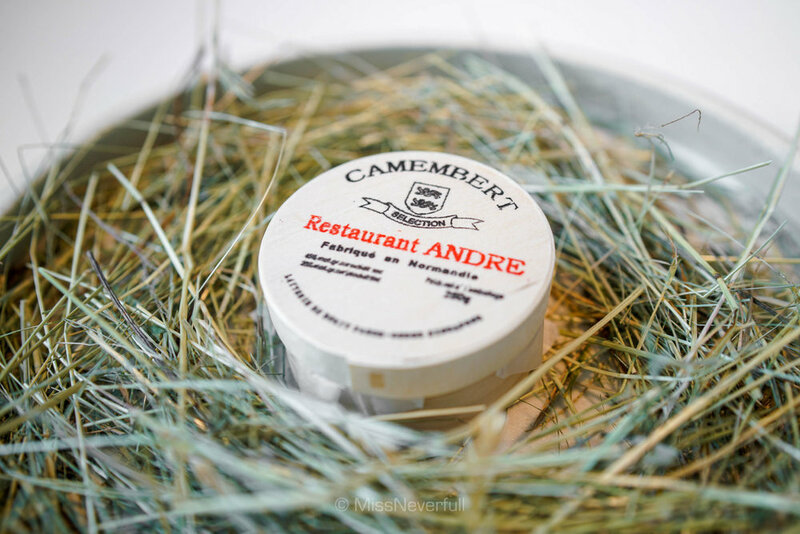 The reason why 'camembert' is because Andre wants to change Asian's view of cheese, as most Asians don't like cheese for their bold smelling and flavors. Andre's homemade camembert again surprised me, it was soft and creamy but tastes so light and fresh. The topped hay ice cream works really well with the cheese. My favorite cheese (dish) so far. After finishing the camembert, i was told to remove the cheese box and find a little notes from the chef. On the note, chef Andre shared the steps he took to make the cheese, as well as the story behind Restauraunt Andre. 'I dreamt about owning a small place, like a little house. One that feeds only a handful of people, a place that will allow me to push the boundaries of my creative mind, reaching out to all, who are curious about my creations. A place that is intimate with a small olive tree and a quaint little blue door will be perfect..."
The last step of the meal was several finger snacks with cup of tea or coffee. On the 'grass' you can find 'kaya toast' macaron, jelly drop of verjus and pine floss, a chocolate lollipop of 'cherry coke', French earl grey Madeline, and on the side, churros with netulla. Wonderfull sweet ending.